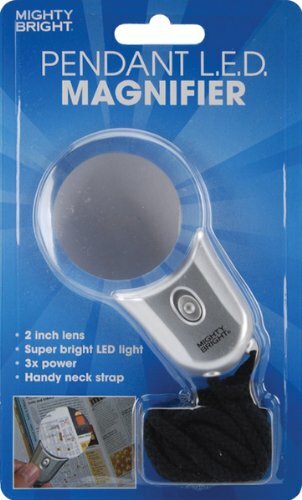 Mighty Bright Pendant LED Magnifier-Silver. MIGHTY BRIGHT-Pendant LED Magnifier. Perfect for fine print; detail work; maps and collectors. Featuring a handy neck cord; a 2in round optical quality lens and super bright LED light with easy on/off switch; 3x power for triple magnification and powered by three G13-A CNB Micro Cell batteries (included). Imported. Sold Individually Please note: If there is a color/size/type option, the option closest to the image will be shipped (Or you may receive a random color/size/type).